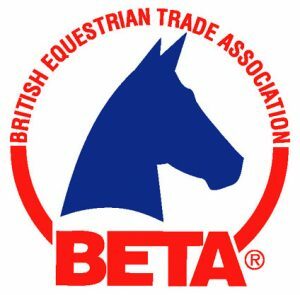 The British Equestrian Trade Association – BETA – is an organisation that represents equestrian suppliers and retailers, and serves riders and horse owners by working for excellence on behalf of equestrian shops and shoppers. Shop where you see the red, white and blue BETA logo displayed by retailers. This is a guarantee that you will receive quality service and reliable advice when you do. Retailers have to earn the right to feature the logo by proving that they are reputable and professional business. If you are ever disappointed with your shopping experience, you can complain to BETA and we will investigate. BETA also trains retailers and ensures that they are kept up-to-date with the latest developments in everything from saddlery to safety so that they can pass this expert advice on to you. BETA created and runs the internationally recognised BETA Body Protector Standard and works closely with the bodies that set and monitor riding hat standards. But even the safest hats and body protectors will only do the job they were designed to do if they fit correctly. BETA trains retailers in the fitting, construction and safety standards of safety equipment. Tackshop staff who have completed a course are awarded a certificate to display in-store. Look out for this when buying a hat or body protector. The trade association also introduced BETA Safety Week for the first time this year to promote the importance of wearing correctly fitted, fastened and up-to-standard safety gear and equipment. The awareness raising initiative taking place from 28 April to 6 May, encourages riders to get their riding hats and body protectors checked before the season ahead. BETA lobbies at government level and works closely with other equestrian organisations. Thanks to BETA it remains legal to buy horse wormers from tackshops that employ a suitably qualified person. BETA’s Feed Committee has introduced a code of conduct, which ensures that manufacturers label their feed and supplements in a legal, clear and fair way. It also launched two important feed assurance schemes – BETA NOPS to reduce the risk of feed contamination by naturally occurring prohibited substances and another that highlights feeds suitable for horses and ponies prone to, or at risk from equine gastric ulcers (EGUS).